Protests over housing prices continued bright and early Wednesday morning, with dozens of students making their way from 'tent city' on Rothschild Boulevard in Tel Aviv towards the city's government buildings. The protesters wore red shirts and beat with sticks on dumpsters. In addition, the Histadrut announced Wednesday that it will join the protests on Sunday if by that time the government had made no significant progress in talks with all "relevant agents". Histadrut Chairman Ofer Eini explained, "There used to be a middle class here, but now it is fading away… There are solutions." Meanwhile police throughout the country struggled to quell illegal tent protests that have sprung up in various parks. In Beersheba, officers dispersed protesters that had pitched tents before the city's municipality building. Organizers of a protest in Netanya also complained that the municipality was attempting to evict them from their protest spot – in front of luxury towers in an upscale neighborhood. The protesters say they will not budge, despite inspectors handing out tickets to their supporters in vehicles. In southern Tel Aviv, municipality inspectors arrived at a hub of tents at 4:30 am to hand out evacuation orders to the young people sleeping there, who complained of being woken up at such an early hour. 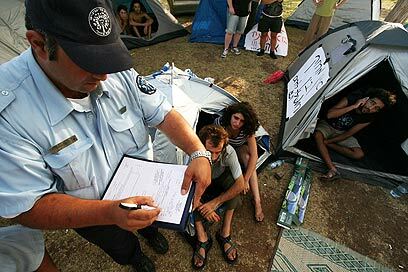 The orders posted on the 15 tents in Levinsky Park said, "Pitching a tent in a public park without a permit is against the law. By the authority vested in me by the mayor, I demand that you remove this tent immediately." Yoni Yehezkel, one of the leaders of the protest in Levinsky Park, said the inspectors had warned protesters that if they did not clear out immediately police officers would disperse them by force. But there was no move to clear the park. "The people don't need a permit," protesters cried out in response to the inspectors' demands. Yehezkel sympathized with the inspectors, however. "They can't refuse to do their job or they will lose it," he said. "But we can tell they definitely identify with us, even if they don't say so." The affordable housing plan presented by Prime Minister Benjamin Netanyahu Tuesday was apparently to no avail in subduing the popular uprising, and protests continued unabated throughout the night. Anat Malka, a 36-year old single mother of three, explained why she had joined the protests. She says she has been eligible for affordable public housing in Jerusalem for eight years, but just like the other 4,000 families in line for the benefits, she has not received them. She says this is due to the fact that not a single new apartment has been built for these families in 10 years. According to data collected from the Construction and Housing Ministry, almost all of the 90,000 apartments allotted to public housing are occupied. The aid offered to 140,000 families eligible for it has also dropped considerably, and is currently between NIS 750-1,500 ($220-440). "Netanyahu's plan doesn’t even mention us," another protester eligible for public housing told Ynet. "We will not accept any offer by the prime minister that does not include a solution for the public housing issue." "Thousands of words were said at the press conference about affordable housing, but two words – 'public housing' – were not mentioned," Karen Shemesh Parelmuter, who heads a legal aid organization, told Ynet. "This is an issue that has been abandoned over the past few years and regards the weakest people in Israeli society." 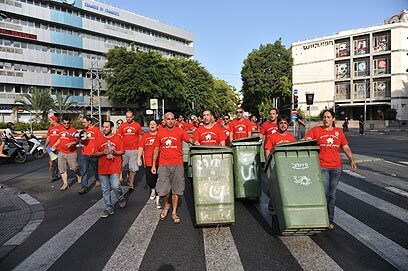 See all talkbacks "Students march with dumpsters in Tel Aviv"